Allergan, the Pharmaceutical company behind Botox®, has released a new advert. It has focussed its attention to patients between the ages of 22-37- the so called “Young Millennials”. Its tag line reads, “looking like you with fewer lines”. At The Treatment Rooms London we wanted to explain what this tag line might mean! Botulinum toxin has been used safely in chemical forms to prevent and treat skin wrinkles. It comes in different formulations and Allergan’s version is called Botox®. More people undergo Botox® treatment than any other cosmetic treatment out there and its popularity is rising. In particular, there has been a 22% increase in those between 22-37 years of age in the last 5 years (figures by the American Academy of Facial Plastic and Reconstructive Surgery). This trend has been mainly down to patients looking to treat before they start to develop the signs of ageing (skin wrinkles, sagging skin). Despite the increasing number of millennials undergoing Botox® treatment, the average age of a patient having Botox® treatment is 46 years old. At 46 you may have already developed skin wrinkles. In these patients Botox® treatment will help in treating these lines, softening their appearance. However, by starting Botox® treatment earlier, before the appearance of these lines can be doubly beneficial. You will be able to prevent these lines from appearing in the first place. This will mean any wrinkles that appear when you age won’t be as deep and noticeable. As the old saying goes, prevention is the best cure! What are patient’s main concerns about having Botox®? At The Treatment Rooms London, we find that many patients worry about looking unnatural following Botox® treatment. This is a concern for those who have been having treatment for years as well as those who are just starting out. Allergan have also picked up this concern and have included an answer in their campaign. “Look like you..” are 3 carefully chosen words. They help put at ease any concerns that you will look radically different after Botox® injections. However, ultimately the only way a patient is going to look natural after having treatment is by choosing the correct Medical professional. Careful assessment and planning of Botox® treatment is the only way patients will be able to achieve natural results. This is best carried out in a dedicated Aesthetics clinic with experienced Doctors and Surgeons. At The Treatment Rooms London all our patients are welcomed into our purpose-built clinic by a Doctor or a Surgeon. This ensures they are in safe hands when it comes to their treatment. At our clinic we treat to achieve natural results that compliment the uniqueness of every patient. So as a millennial or a middle aged patient, you can be rest assured you can Look Like You With Fewer Lines. With increasing clamour for regulation in the aesthetic industry, dermal fillers have come under the lens again. The Guardian has recently talked about dermal filler regulation. This blog will summarise what is going on! The British Association of Plastic, Reconstructive and Aesthetic Surgeons have issued a warning about the lack of regulation in the industry. We already know the dangers of going to see a non-medical professional to have cosmetic surgery (click here for Rachael Knappier’s horror dermal filler). Unlike many other countries- anyone can inject a dermal filler in the UK. This has meant there has been many beauticians and non-medical professionals picking up a needle and syringe to inject a patient’s face. Needless to say, there has been a sharp increase in complications. MPs are now becoming concerned with the increasing pressure from healthcare professionals to have the industry more regulated. A Save Face report found a total of 934 complaints about non-surgical procedures in 2018- this was an increase of over 200% from 2016! Approximately 60% of these complaints were patients concerned about their dermal filler treatment with half of these patients having to have their treatment corrected by an actual healthcare professional. Worryingly, 11 patients ended up in A&E. At The Treatment Rooms London, we make it clear- if you are a patient you need to have a clear idea of who you are seeing for treatment. They should be a medical professional (e.g. Doctor or Surgeon) and they should have sound understanding of the medical treatments they are providing. If your injector can’t answer your questions, can’t take you through the risks of a procedure and can’t manage any complications that can arise- that is a big red flag! Read more about this topic by clicking (here). What is the current dermal filler regulation? Dermal fillers are classified as a medical device in Europe. This means they don’t have to go through the stringent testing that medicines have to go through. Unlike America which has 10 approved dermal fillers. Europe has a whopping 160 approved dermal fillers! At The Treatment Rooms London we are seeing patients coming to see us to have their dermal filler corrected. Often they have seen an inexperienced non-medical injector who has sourced their filler online. These fillers are usually poor quality, cheap and unregulated. If you knew the substance that was being injected in your face didn’t meet stringent medical tests would you still agree to have treatment? What happens at The Treatment Rooms London? At The Treatment Rooms London we source all our fillers directly from approved, vetted and regulated manufacturers. This means our patients receive high quality fillers. No corners or costs are cut to ensure high quality and safe care for our patients. All our injectors are Doctors and Surgeons- not nurses or allied healthcare professionals. Our Doctors and Surgeons go through all risks of treatment before commencing any procedure. In our dedicated, purpose built clinic, procedures are performed in a sterile environment. Being a CQC-registered clinic for cosmetic surgery we are able to perform a wide range of procedures- legally meeting the high standards of CQC regulation. If you wanted to find out more, please don’t hesitate to contact us today. At The Treatment Rooms London, we have been providing jowl thread lifts to patients across London and internationally. Being one of the most popular treatments, we wanted to write more about the procedure. A jowl is the drooping bit of skin and fat on your jawline. It is mainly caused by the fatty tissue in your face moving downwards as you age. In the end, the appearance of a jowl can make you look sad, tired and older. In the before picture above you can see a clear sag in the jawline caused by skin and fat. This is a typical jowl. Before thread lifts were introduced, the main treatments available to combat the problem were dermal fillers or a surgical face lift. However, there comes a point when you cannot place more filler without looking unnatural. Secondly, in some patients the jowl has sagged so much that using fillers would not make any difference. This is where a jowl thread lift works best. If you were looking to have a procedure that had less downtime than a surgical face lift the best treatment option for your jowls is a thread lift. What is a jowl thread lift? A thread lift is a minimally invasive treatment. By placing a thread under the skin and into the fat tissue we can pull these threads up to lift skin and fat. The thread is the same material used in surgery to stitch wounds and at The Treatment Rooms London we use polydioxanone (PDO) threads. These threads have small tags on them that help to latch onto skin and fat so when the thread is pulled up, the skin and fat are pulled up too. A jowl thread lift is a treatment that places these threads across your jawline. The threads are pulled up to lift the jowl up the face and remove it sagging across the jawline. This results in a defined natural jaw. At The Treatment Rooms we often combine the treatment with a dermal filler placed in the pre-jowl area. This means your jaw is not only defined but has a natural contour that suits your face after a thread lift. In the video above you will see a jowl thread lift in action performed by one of The Treatment Rooms’ Doctors. You will see the PDO thread being placed across the jawline eventually tied and tightened to lift the jowl. After the treatment you may have a bit of swelling and bruising but you can go back to your daily activities. We recommend you don’t eat any chewy foods for 7-10 days and don’t exercise for 5 days. Any pain you may feel should be mild and can be managed with Paracetamol or Ibuprofen. At The Treatment Rooms London, we use local anaesthetic to make sure you don’t feel any sharp pain. You may feel a bit of tugging and pulling during the procedure and this is normal. 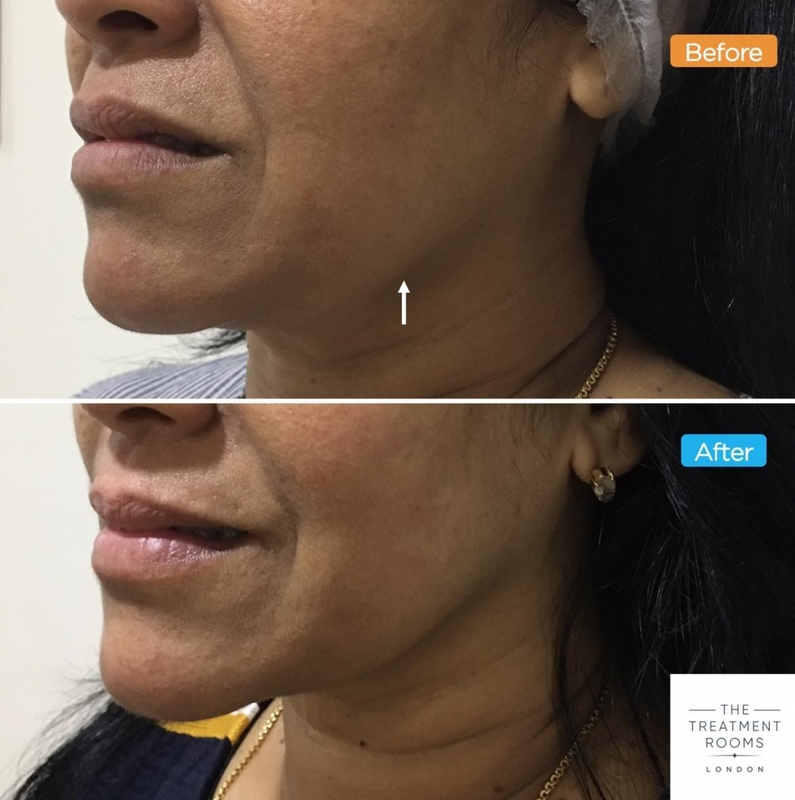 Lifting the jowls using PDO threads to define the jawline. Results last 2 years. Body Dysmorphic Disorder (BDD) has been in the news recently as Superdrug have been told they are could do more to check that their patients are not suffering from BDD before they recieve Botox® injections. This blog will help provide you some extra information on the condition and how patients should be treated. Body Dysmorphic Disorder (BDD) is a well known mental condition where someone is obsessed with a part of their body being flawed and goes to extreme lengths to correct the apparent defect. Despite having treatment these patients often are dissatisfied and continue to focus on minor defects or flaws. This fuels a vicious cycle of “perceived flaw-treatment-perceived flaw” and actually the patient is best treated with psychological or psychiatric therapies. Without psychological treatment, some patients with BDD may end up having numerous cosmetic treatments and plastic surgeries in order to fix problems that are not there. Should I be worried I have BDD? In short the answer is no. There is a difference between those suffering from Body Dysmorphic Disorder and patients who would like to undergo cosmetic surgery to address an aesthetic problem. BDD is a psychiatric condition that manifests as an obsession over appearance and over-treating a problem that no-one else notices. Rarely, patients with BDD can incorrectly undergo a number of cosmetic surgeries over their lifetime. In the UK it is actually illegal for Doctors to provide cosmetic treatments to patients potentially suffering from BDD. It should be your Doctor’s duty to assess for Body Dysmorphic Disorder in their consultation. If they are worried you may be suffering from the condition then they may refer you to a specialist. These symptoms can be particularly distressing and patients often find it really affects their life. Some patients can even suffer from depression that can lead to self harm or suicide. People who have had numerous cosmetic treatments are easy to spot and there are a few well known individuals who are thought to suffer from the condition. Recently Rodrigo Alves– who has had a total of 62 cosmetic surgeries and spent approximately £600,000, underwent his latest treatment- a face reduction procedure. His previous treatments include Botox®, Dermal Fillers, Hair Transplantation, Thread Lifts, nose jobs, implants into his chest, liposuction and more. At The Treatment Rooms we believe his surgeons and Doctors should look beyond what Rodrigo may want to have and assess whether having treatment in the first place is in his best interests. Interestingly, Rodrigo Alves regular admits to being bullied as a child by his school friends. This might make him predisposed to having BDD but there is no way of telling unless a full psychiatric assessment is made. How do the Doctors and Surgeons at The Treatment Rooms London address BDD? Our Doctors and Surgeons are fully trained to notice the clues that a patient may be suffering from Body Dysmorphic Disorder. In all patients requesting Hair Transplants, Hair Loss treatment, Botox®, Dermal Fillers and even Thread Lifts our Doctors fully assess your health and wellbeing to make sure you are safe to have treatment. If they are at all concerned they are more than willing to talk you through their concerns. This may include referring you to your GP or to mental health services for assessment. We’ve talked about them before and we wanted to write something again. Botox® Parties have been in the press recently- mainly for negative reasons. This blog highlights the main points. They are informal gatherings for friends to catch up, have drinks and be given Botox® injections. Are these parties a good idea? An article by The Guardian highlighted how there are an increasing number of these parties. They appear fun and a good way to catch up between friends. As Botox® lasts for 3-4 months, regularly scheduling Botox® parties gives those attending the chance to have repeat treatment when the effects have worn off, but allows friends to catch up on a regular scheduled basis. It sounds convenient but at The Treatment Rooms London- we advise strongly against them. They are not a good idea. Why are Botox® Parties are bad idea? There is a government petition currently circulating highlighting the risks posed in the UK by non-medical professionals injecting Botox® and Dermal Fillers. Injecting someone’s face with a needle obviously requires strong clinical understanding of the anatomy of the face and the medicine (Botox®) you are giving. If you aren’t trained in either of these important pillars of aesthetic medicine then you are clearly not practising safely. In the UK there is currently no law that prevents a non-medical professional injecting Botox® or Derma Fillers. Together with the rise in popularity of these treatments over the last few years, there has also been a number of cases of tragic complications from poor treatment- often when a patient has been treated by someone who is not a Doctor, Nurse or Dentist throwing a Botox® Party. Treatment like Botox® should be given in a clean, sterile environment and certainly not when you have just had a few alcoholic drinks. Part of undergoing Botox® treatment includes going through a thorough consultation including a full consent process where a patient is allowed to weigh up the decision to undergo treatment or not. There is simply no place for alcohol which can cloud a decision and leave patients regreting any choices made after having treatment. It is no wonder there has been a few horror stories about people having complications after having treatment at a Botox® Party. We cannot emphasise enough- if you have been invited to a Botox® party- please think twice and suggest an alternative environment to catch up with friends. Where should you be having Botox®?